Sciblogs | NZ’s Quitline Service is value-for-money: But how does it compare with other tobacco control actions in a league table? NZ’s Quitline Service is value-for-money: But how does it compare with other tobacco control actions in a league table? We have just published a journal article on the cost-effectiveness of NZ’s Quitline service (including its associated promotion in the mass media). The study found that this intervention package is likely to be an effective means to generate health gain, address health inequalities and save costs for the NZ health system. But in this blog we also compare the New Zealand Quitline intervention with other tobacco interventions using our just launched BODE3 Interactive League Table, and find that whilst the Quitline is a good thing to do, much more health gain is possible through other tobacco control interventions. In our just published study in the peer-reviewed journal Tobacco Control, we used an established multi-state life-table model (1-3) to explore if the current NZ Quitline Service and its promotion in the mass media is value-for-money. Effect sizes and intervention costs were based on past NZ Quitline data and health system costs were from a national dataset linking individual health events to costs. The modelling results suggested that a one year operation of the existing intervention package of mass media promotion and Quitline service was found to produce a gain of 4200 quality-adjusted life-years (QALYs, discounted at 3% per annum) and be net cost-saving to the health sector. This cost-saving was apparent for all age-groups, sexes and ethnic groups, with the total saving to the NZ health system being $84 million [m] (95% uncertainty interval: 60 m to 115 m) over the remaining lifetimes of the NZ population alive in 2011. This intervention also produced three times greater per capita health gains for Māori than non-Māori. As such the Quitline appears to be contributing to reducing health inequalities, as we have also found for other tobacco control interventions (1-3). While our modelling was primarily for the Quitline intervention ‘just’ in one year (ie, 2011), when we did run the Quitline/mass media package for 20 consecutive years it was estimated to generate a total of 54,000 discounted QALYs and NZ$ 1.10 billion in cost-savings. We are fairly confident in these results as the net cost-saving of the intervention package was maintained in all sensitivity and scenario analyses. This included at a discount rate of 6% (our base case analysis used 3%) and when the intervention effect size was quartered (given the possibility of residual confounding in our estimates of smoking cessation). Nevertheless, the management of the Quitline has recently changed from the one we used for parameter inputs to a new service, and the performance of this new service is not yet fully clear. Also, as with some other preventive interventions, it does take decades for the peak health gains and cost-savings to kick in. But the fact it was still cost-saving at a 6% discount rate should allay the concerns of those primarily interested in short-run benefits. So the Quitline and its mass media marketing seems like very good value-for-money as the intervention generates health gain and reduces health inequalities – while also saving health dollars. Indeed, we suspect that the benefits are even greater than we have estimated given our modelling only includes 16 tobacco-related diseases (and many others exist). Our model also does not include the reduced harm from second-hand-smoke and various other benefits (eg, financial savings for smokers who quit; and productivity gains associated with workers who don’t die prematurely from smoking). The cost-effectiveness of the NZ Quitline might also be improving given advancing knowledge around effective marketing strategies (eg, including marketing on social media). For example one international study has reported large efficiency gains from greater use of online advertising for quitline services (5). The NZ Quitline service is indeed impressive in a number of ways and is particularly notable for its relatively high reach (5,6), including to Māori smokers (5). But potentially its impact for Māori and Pacific smokers could be enhanced further by even more investment in targeted marketing. There could also be merit in increasing use of “by Māori, for Māori” media campaigns as per the successful “It’s About Whanau” campaign (7-9). But how does Quitline compare with other options? 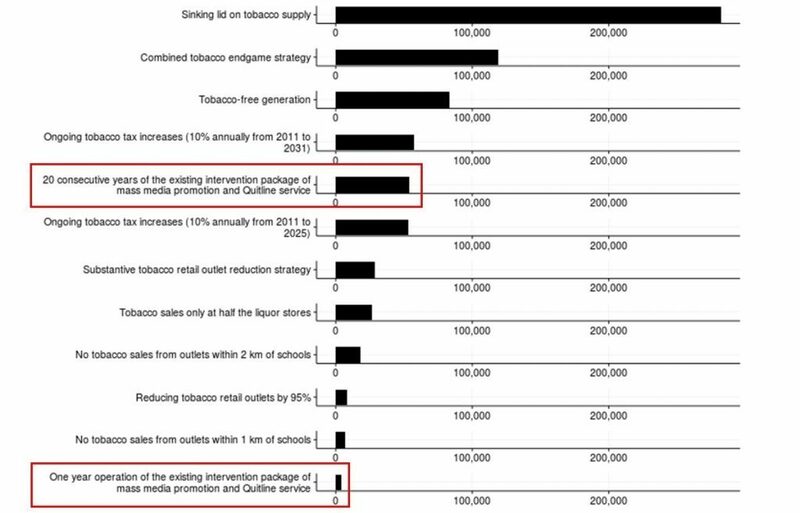 Although the Quitline/mass media package appears to be good value-for-money – it is unlikely to be the best tobacco control intervention available. We have recently developed a BODE3 Interactive League Table – Figure 1 below is from that league table with the one-year and 20-year variants of the Quitline intervention outlined in red. Much more health gain would probably be achieved by regular increases in tobacco tax and from various “endgame” interventions. The latter include a package of interventions (tax, outlet reduction and a tobacco-free generation), or a sinking lid on tobacco sales (see this article: (3), and this recent blog for details). The latter would have the advantage of achieving the NZ Government’s Smokefree 2025 goal (3). Indeed, a number of these types of endgame strategies and others like mandated de-nicotinised cigarettes are in the recently launched Action Plan for achieving Smokefree Aotearoa by 2025. Figure 1: Screenshot from the BODE3 Interactive League Table – showing tobacco control interventions (QALYs gained on x-axis, at 3% discounting). But what if the Government doesn’t use endgame strategies? Continuing the current series of tobacco tax increases (of 10% increases annually) until 2025 (instead of only to 2020). Ideally some of the revenue from these taxes should go to help smokers to quit. More ideal would be the level in the new Action Plan of 20% increases together with a minimum price regulation to prevent differential price increases by the tobacco industry to keep budget brands affordable. Adopting at least a bare minimum tobacco retail licensing scheme (10), which could be tightened incrementally. Alternatively to prohibit certain types of retails (eg, outlets near schools or those which also sell alcohol). Boosting funding for tobacco control mass media campaigns (and linking some of these campaigns to provision of support via the Quitline). The optimal use of online advertising needs ongoing research as does the relevance of successful USA-based mass media campaigns for the NZ setting. Getting the best value out of any liberalised e-cigarette environment by limiting e-cigarette sales to only pharmacies or specialist vape shops (if appropriately regulated). This should ensure that vapers get the best advice around using e-cigarettes to support quitting or the successful and sustained transition to vaping from smoking and to minimise risks of relapse to smoking and uptake among youth (see this previous blog). If tobacco taxes go up further – we should also see further shifts to e-cigarette use, as these products are substantially cheaper per dose of nicotine delivered. Potentially promoting smartphone apps for smoking cessation on health agency websites (our research on this topic is still ongoing). 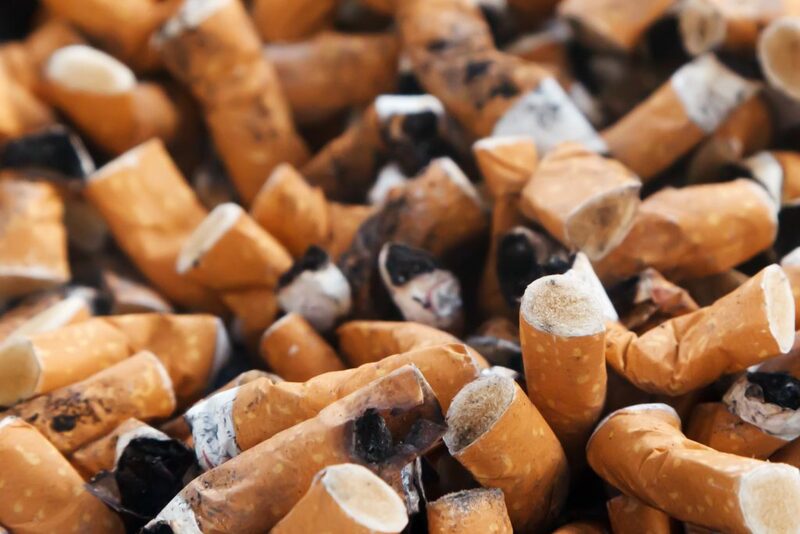 Reviewing PHARMAC’s investment in subsidising smoking cessation medications. We suspect that such investment might be more efficiently used in mass media campaigns or online quit advertising (but this needs further investigation). Boosting the power of local government to allow it to do more on tobacco control. If local government was given more powers from central government, then we might see the type of innovation seen in the USA. Here some states and cities/counties: require outdoor drinking/dining to be smokefree, ban smoking in cars with children, adopt bylaws against smoking in children’s playgrounds, and even introducing sinking lids on local tobacco retail outlets. Enhancing alcohol control would probably provide spin-off benefits for tobacco control (since most evidence indicates that drinking and smoking are complementary (11-17) and drinking is associated with relapse to smoking). Again in the face of minimal central government action on alcohol control in recent decades – this would be another area where local government powers could be enhanced. Unfortunately the selection of just these type of alternative and ‘incremental’ tobacco control options (rather than endgame ones in the Figure above) will probably be at the cost of many premature deaths before the tobacco epidemic finally ends. It will also mean a substantial missed opportunity to save taxpayer dollars. Our just published study found that this Quitline/mass media intervention package is an effective means to generate health gain, address health inequalities and save costs for the NZ health system. But it is not the best single strategy or nearly as effective as tobacco endgame strategies. As governments might select the easier, or non-endgame, options, NZ health workers need to be prepared to promote a wide range of alternative tobacco control strategies – whilst continuing to advocate for a comprehensive approach including endgame interventions such as that outlined in the new Action Plan to Achieve a Smokefree Aotearoa. Acknowledgements: This work was supported by funding from the Ministry of Business, Innovation and Employment (MBIE), grant number: UOOX1406. Work on the original model was supported by a grant from the Health Research Council of New Zealand (grant 10/248). Featured image: Quitline’s 2016 media campaign. Quitline/youtube. Clayforth C, Pettigrew S, Mooney K, Lansdorp-Vogelaar I, Rosenberg M, Slevin T. A cost-effectiveness analysis of online, radio and print tobacco control advertisements targeting 25-39 year-old males. Aust N Z J Public Health. 2014;38(3):270-274. Wilson N, Weerasekera D, Borland R, Edwards R, Bullen C, Li J. Use of a national quitline and variation in use by smoker characteristics: ITC Project New Zealand. Nicotine Tob Res. 2010;12 Suppl:S78-84. Borland R, Li L, Driezen P, Wilson N, Hammond D, Thompson ME et al. Cessation assistance reported by smokers in 15 countries participating in the International Tobacco Control (ITC) policy evaluation surveys. Addiction. 2012;107(1):197-205. Quitline. Quitline Me Mutu Annual Review 2013/2014. Wellington: Quitline; 2014. Robertson L, Marsh L, Edwards R, Hoek J, van der Deen FS, McGee R. Regulating tobacco retail in New Zealand: what can we learn from overseas? N Z Med J. 2016;129(1432):74-79. Jimenez S, Labeaga JM. Is it possible to reduce tobacco consumption via alcohol taxation? Health Econ. 1994;3(4):231-241. Room R. Smoking and drinking as complementary behaviours. Biomedicine & Pharmacotherapy. 2004;58(2):111-115. Pierani P, Tiezzi S. Addiction and interaction between alcohol and tobacco consumption. Empir Econ. 2009;37:1-23. Tauchmann H, Lenz S, Requate T, Schmidt C. Tobacco and alcohol: complements or substitutes? Empir Econ. 2013;45:539-566. Lee JM, Chen MG, Hwang TC, Yeh CY. Effect of cigarette taxes on the consumption of cigarettes, alcohol, tea and coffee in Taiwan. Public Health. 2010;124(8):429-436. Rogers ES, Dave DM, Pozen A, Fahs M, Gallo WT. Tobacco cessation and household spending on non-tobacco goods: results from the US Consumer Expenditure Surveys. Tob Control. 2017;(E-publication 16 March). Picone GA, Sloan F, Trogdon JG. The effect of the tobacco settlement and smoking bans on alcohol consumption. Health Econ. 2004;13(10):1063-1080. New Zealand Government. Government Response to the Report of the Māori Affairs Committee on its Inquiry into the tobacco industry in Aotearoa and the consequences of tobacco use for Māori (Final Response). Wellington: New Zealand (NZ) Parliament, 2011. http://www.parliament.nz/en-nz/pb/presented/papers/49DBHOH_PAP21175_1/government-final-response-to-report-of-the-m%c4%81ori-affairs.